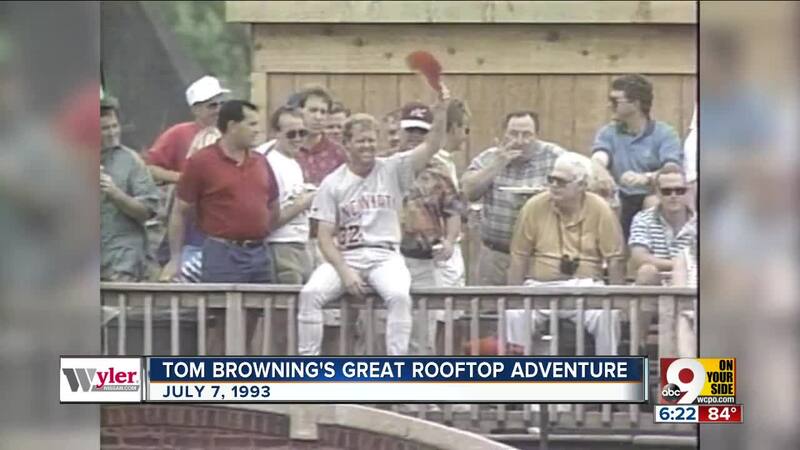 CINCINNATI – Five years after pitching the only perfect game in Reds history, Tom Browning pulled off the perfect baseball stunt. 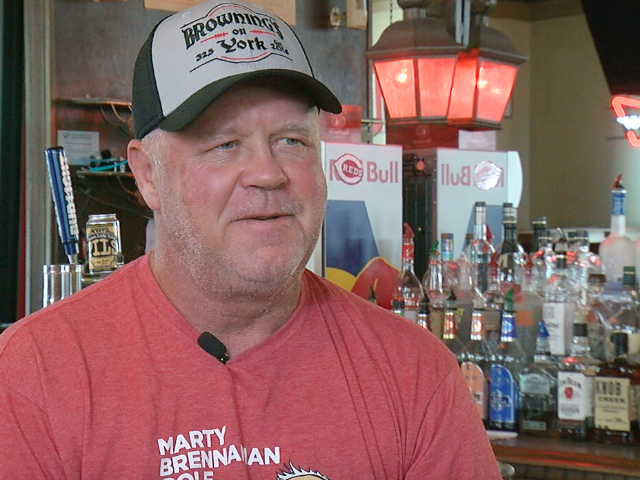 Tom Browning owns a Newport bar now. Reds fans still talk about the day 25 years ago – July 7, 1993 – when Browning snuck out of the bullpen at Wrigley Field, walked across the street to an apartment building and joined a party of Cubs fans on the roof during a game. While the surprised partiers laughed and drank, Browning, still wearing his uniform, casually dangled his feet over the railing, doffed his Reds cap and waved at his teammates and TV cameras. WATCH more of Browning on the roof below. After they got over the shock, Reds players in the dugout laughed and waved back. Browning was right about that. The Reds' new manager, Davey Johnson, read him the riot act after the game and fined him $1,000. It wasn't the only time Browning left a game in progress. He left a 1990 World Series game to take his wife to the hospital after she went into labor at the ballpark. Their son, Tucker, now manages Browning's bar in Newport. The fun-loving Browning wasn't scheduled to pitch at Wrigley on that 1993 day and he said his first thought was to go inside the giant, manually-operated scoreboard. Browning said he wasn't in danger of falling to his death. “I wasn’t on the edge of the building where, if I fell, I would have fallen three floors. There was a landing right below me, so I wasn’t taking any kind of chances," he said. Browning said he was trying to give the team a morale boost after the sudden firing of manager Tony Perez six weeks earlier. “I wanted to give us some levity. We were struggling,” Browning said. “Tony had been fired and we kinda lost that little steam because we wanted to play for Tony. Not that Davey was a good or bad manager. We just really wanted to play for Tony." Browning said he was only gone an inning but he figured he deserved the chewing-out he got from Johnson in the manager's office after the game. Browning said it was worth the fine and he briefly aired his feelings about General Manager Jim Bowden firing Perez just 44 games into his first season as manager. "We didn't really enjoy playing for him," Browning said of Bowden. "We were all scatterbrains after that (Perez' firing)." "I did it for all the right reasons," he said about his stunt, "and I'd do it again if I had to." Obviously, 25 years later, people still ask him about it. "I didn't expect to get the kind of attention I got," he said. Browning will be back on the roof Saturday to mark the occasion at the Cubby Bear Rooftop Bar in Chicago. Reds fans are invited to hang out with Browning during the Reds game (2:20 p.m. EDT). Fifty tickets are available for $175 including food and drinks. If you're interested, call the Reds Hall of Fame at 513-765-7923. His bar, Browning’s on York, is right across the river from the ballpark. He took over three months ago. “It’s a small enough, neighborhood-y kind of feel, which is what I wanted,” Browning said. Browning said he’s there often and enjoys chatting with customers about the Reds - past and present. He also tends bar on Sundays.